Clock towers have historically been incorporated into public buildings in Texas. Several county seats across the state bear such a clock as part of a courthouse, typically in the center of town. Sadly, many are in need of attention; some, complete restoration. The Southwest Museum of Clocks and Watches has established a Tower Clock Initiative for the restoration of these most impressive national treasures. The initiative will see these clocks transported to the museum for restoration in its open workshop area. There, they will play a vital role as an adjunct to the museum’s permanent collection in providing a more complete, working horological education. After restoration is complete, each clock will be re-installed into its tower, reviving an invaluable part of our state’s heritage. The Texas Historical Commission came to us seeking help on behalf of the Texas Association of Counties for assistance in the restoration of their tower clocks. There are about 55 counties that have clocks in their towers. Only a few of these clocks are operational. On April 9th, 2010, the THC invited us to make a presentation to the annual convention of the TAC in Austin on the Maintenance and Restoration of Courthouse Tower Clocks. The Texas Historical Commission is to be commended for their support of the counties in preserving the courthouses and tower clocks for future generations to admire and enjoy. 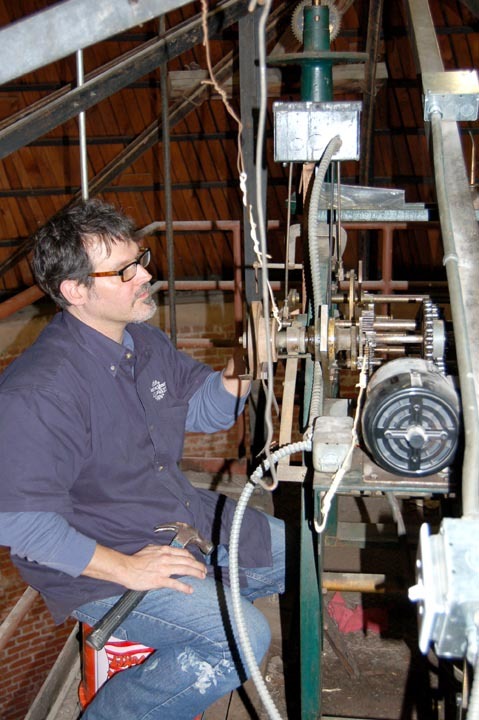 The Museum has been busy answering inquiries on tower clock restorations since 2010. Above: Ursuline Covent/SW School of Art Clock in San Antonio. The clock was made in France by Cretin, circa 1850's, and is rarely found in the U.S. The convent was established in 1851, but the clock was installed in 1866. The clock has not been running for the last 30-40 years and has now been restored by Gene Galbraith of the Museum.